The famous bronzes of Tamilnadu are as a rule solid cast, unlike other Indian bronzes, which are hollow cast. The figure is modeled in clay and simply covered with a coating of wax, whereas in solid casting the figure itself is modeled in wax. In both cases, the wax is replaced by the metal, the process known as cireperdue casting, for which the Sanskrit term madhūcchiṣṭa (wasted honey) is an exact equivalent. It is still practised today. Tamilbadu bronzes are distinguished by their simplicity of composition, usually comprising a single figure, sometimes two, a god and his consort, and, rarely, three; Śiva’s bull is sometimes included, not in miniature but on the same scale as other figures. There are generally no aureoles or subsidiary figures. Individual figures range from not much more than inch-high up to three feet. In fact more sizable images in bronze were produced in Tamilnadu than in any other part of India. 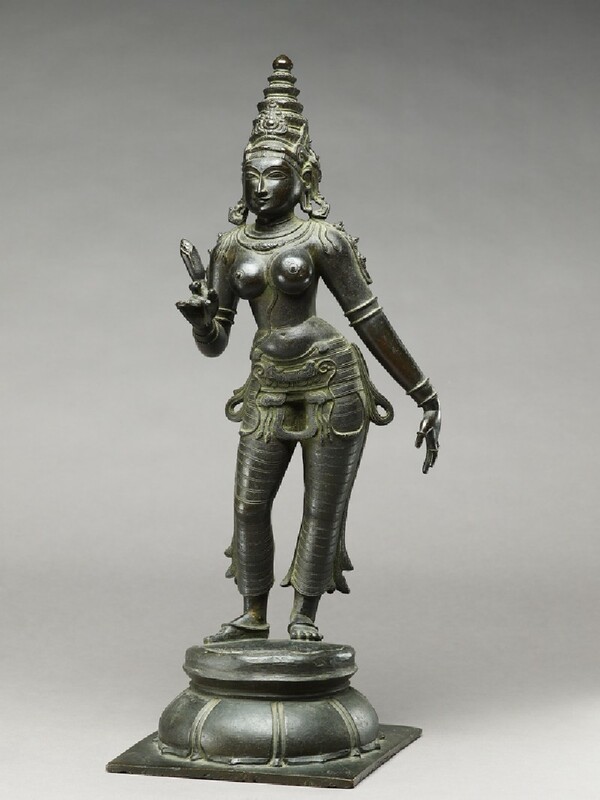 The great age of bronze sculpture in Tamilnadu was from the 9th to the middle of the 11th century, when the later Pallavas and early Coḷas ruled. Many of these works are unsurpassed anywhere in the world for their gracefulness, perfect proportions, and quiet assurance. In not other culture have the gods been portrayed so appealingly in human form. Gaurī is a particularly gentle and benevolent form of Pārvatī. Her right hand holds a lotus bud, her left hangs at the end of a drooping and slightly out-thrust arm in the mudrā known as lolahastamudrā. The portrayal of feminine costume and adornment, although slightly simplified, has barely changed the 10th century and the proud set of the youthful head, in side view, which is reminiscent of the finest Coḷa sculpture, makes it difficult to date this sculpture accurately. The exaggerated bhaṅga (déhanchement) of the body, the way it is conceived in sections, seen full face, and a general hardness of plastic treatment, as well as the summary execution of some of the features of the face, unmistakably point to a later date.